Congratulations on purchasing your new older home! You just purchased an older Seattle home. That's got to be very exciting! Maybe a few days or weeks have gone by and you’ve started to notice a few problems. Or, you may have been aware of some problems, based on your home’s inspection report. In either case, call Raymark Plumbing and Sewer if you need any help with your older home. We have decades of experience and expertise in helping solve problems that arise with old plumbing, drains, fixtures, and sewers. As you know, some older homes are built very well, but others come with a set of problems. Luckily, most problems are fixable. If you are on a strict budget, you may choose to tackle one or two problems per year. Your plumber can give you estimates on what fixing each problem will cost. In addition, he’ll help you prioritize work that should be done immediately and help determine which work can be done later. Are there signs of water leaks? E.g. stains on the ceiling, walls, or floors? Are the water pipes made of copper, galvanized, or plastic? How old is the hot water tank? Are there any signs of rust or leaks? Do the drains flow well? Are there any backups? Do the toilets empty and fill quickly? Are the toilets securely fastened to the floor? Is there a sewer smell? How is the water flow and water pressure? Is the home’s main water shutoff accessible, clearly marked, and in good working order? Are the kitchen faucets to your liking? Do you know where your city water meter is outside? Is it one you can turn off yourself in an emergency? 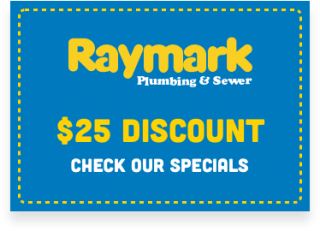 If any of these are your home’s problems, Raymark Plumbing and Sewer can fix them. 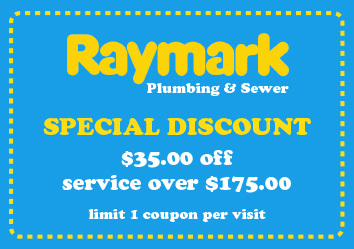 Call Raymark at 206-430-1954 to schedule an appointment. If wanted, you can take pictures and send them to us before the plumber comes out. In some homes, the previous homeowner kept a Home Book to pass along to the new owners. If you are lucky enough to have this, see what plumbing and sewer work has been performed previously in your home. If the previous homeowner used Raymark, we have history for your address going back at least 5 years, and in some cases longer. The City of Seattle keeps permits on record. Check these to see if work was done on your house address. Above all, know that we at Raymark are happy to help you make your new house your home.